The Council of Forest Industries’ (COFI) annual convention is back, a signal that the industry is solidly in recovery mode, which is good news for all the forestry dependent businesses and communities in the B.C. Interior. It’s back. The Council of Forest Industries (COFI) annual convention is returning to Prince George, British Columbia after a three year recession-induced hiatus. The event is scheduled for September 15-16 at the Prince George Civic Centre. 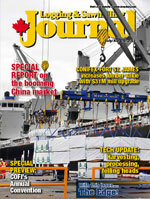 COFI’s re-emergence on the calendar is viewed as solid evidence the forest industry is in recovery mode. The convention’s triple themes—recovery, transformation and renewal—clearly indicate the signposts directing future growth and development. Pundits predicting precisely when the U.S. market begins a solid growth phase do so at their peril. “However inventories (of housing units) are in a declining trend and that’s positive,” reckons Routledge. He says COFI’s decision to re-introduce the convention this year, albeit in a shorter, fall version, was also a response to feedback received from the organization’s membership and suppliers. The COFI convention creates a valuable information exchange, notes Routledge. COFI conventions have routinely attracted hundreds of attendees. Forest industry CEOs from western Canada, the U.S. and offshore are joined in the “must attend” event by a broad cross section of the business community and political decision makers. Prince George and Kelowna have been alternating as hosts to the annual COFI convention and Routledge anticipates the event will return to its traditional April calendar date in Prince George for 2013. The sustained strength of Asian markets for regional forest products has been a welcome feature of recent months and a contributor to the industry’s guarded optimism. The development of markets in China, Japan, Korea, Taiwan and elsewhere have helped keep some loggers and their sawmills operating when closure and production curtailments might have been the only alternative. In other cases, sawmills have re-opened specifically to meet Asian demand, led by a resurgent China. The re-opening of mills, usually beginning with a single shift daily, has proved a lifeline to regional loggers, equipment dealers and services and has helped re-circulate cash through forestry dependent communities. The interior’s devastating mountain pine beetle epidemic means regional lumber producers needed a home for lower grade material. “China has become a home for that volume,” observes Routledge. Regional sawmills in concert with sawmill equipment manufacturers have become expert at developing machinery that produces lumber of surprising quality and appearance from low grade timber that would have been rejected out of hand just a few years ago. There have been at least two side effects. The shelf life of beetle killed wood for commodity lumber production has been extended, observes Routledge. 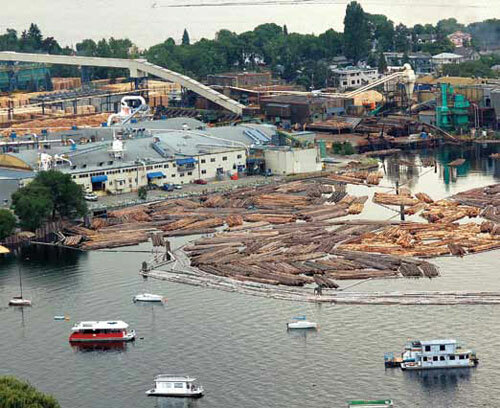 “And we’ve been able to stay out of the green.” Leaving green timber to continue growing as long as possible will help mitigate the severity of the wood supply downturn that’s anticipated to varying degrees throughout the B.C. Interior. The emergence of China and the growth in other Asian markets is not the result of divine intervention. It stems from years of concerted, committed and conscientious work. “COFI and other industry associations along with the provincial and federal governments have done a lot of work relationship building in China,” explains Routledge. “We’ve helped remove trade barriers and increased shipments.” It’s no longer just low quality shipments; volumes of grade two and better are on the increase. Routledge adds that the work in moving the Chinese market forward is, in part, guided by lessons learned in forest product development in other Asian countries. The COFI convention’s return sends positive signals to the local and regional business communities. Sawmills, pulp mlls and value added manufacturing plants pay considerable sums in taxes to the local and provincial governments along with creating significant direct and indirect employment. It sends positive messages to the regional business communities when more sawmills and wood remanufacturing plants ramp up production. The forest sector is also being perceived as more than a ready source of funds by local government. The City of Prince George, for example, looked to Lakeland Mills to create a partnership to address a long standing social issue. By using excess wood residues generated by Lakeland to produce energy to heat downtown civic buildings, airshed quality improvements are anticipated. Dan Rogers, Prince George’s mayor, believes the district energy system will improve air quality through particulate reduction and reduce greenhouse emissions. “As local governments work together towards the reduction of community greenhouse gas emissions, projects like the Prince George District Energy System increase our understanding of the bio energy potential of industrial waste products,” added Harry Nyce, president of the Union of B.C. Municipalities.